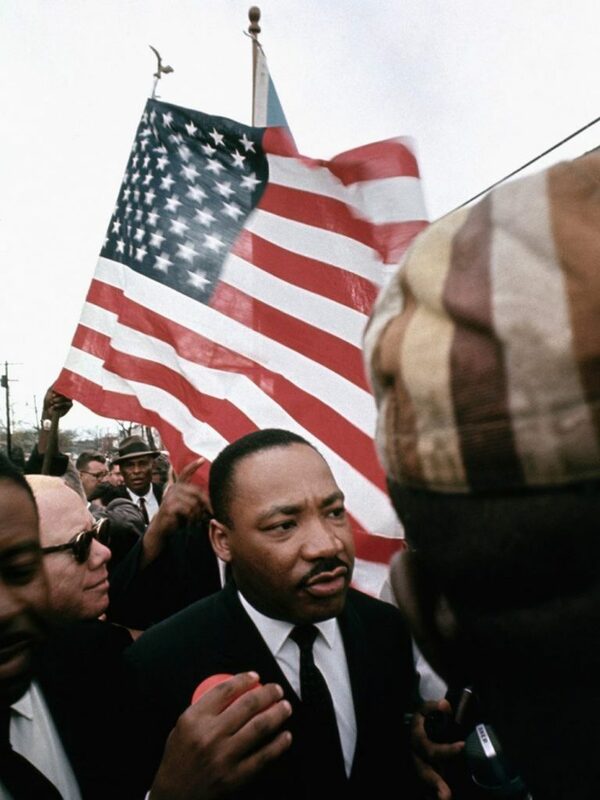 Martin Luther King, Jr at one of the marches from Selma to Montgomery. The demonstraters demanded equal voting rights for all citizens. Photo: Flip Schulke/Corbis via Getty Images. The exhibition sheds light on how Martin Luther King, Jr – as leader of the American civil rights movement – fought for the rights of African-Americans. A fundamental tenet of his message was that the fight for equitable conditions can and must be waged without violence. Martin Luther King’s life and work are a fascinating part of an important stage of 20th-century history. His fight contributed to several important legislative changes and other advancements. His dreams, ideas and ability to express them seem timeless. And his ideas extend far beyond his own time and the society in which he lived. Discrimination and conflicts because of skin color or ethnicity manifest themselves in a variety of contexts in our own world. Through Martin Luther King’s life and actions, the exhibition aspires to encourage thoughts and discussions about issues such as segregation and integration, human rights and social injustice, diversity and equality, religion and ethics, resignation and conviction. How can a fight without violence be waged? What structures and prejudices do we live with today? What impact can the individual have on the process of change? The exhibition features extensive graphic material, objects and documents, films with special interviews, music and opportunities for visitors to share their own impressions. Digital media is available in conjunction with the exhibition. The material in the exhibition and the digital media also serves as the basis for a school program. The stories about Martin Luther King’s life and work serve as a starting point for discussions on both generally applicable and specific topical issues. The exhibition is divided into eight parts that deal with different aspects of his life and deeds. Each part also illuminates various human rights. The idea that we are all born free, with equal worth, has its roots far back in history. Two important documents in which this idea is expressed are the 1776 American Declaration of Independence and the 1948 United Nations’ Universal Declaration of Human Rights. However, until 1865 slavery was an integral part of society in the American South, and discrimination against African-Americans sanctioned in law persisted until the middle of the 20th century. Martin Luther King’s struggle was about making the idea of equal rights for all a reality. One of the ways this was expressed was in his most famous speech, “I Have a Dream,” delivered in 1963. Segregation of blacks and whites had a major impact on society and life in the American South. African-Americans were subjected to oppression and violence. Demands for better conditions grew. In Atlanta, Georgia, where Martin Luther King grew up, discrimination was widespread, but some African-Americans still managed to build competitive businesses. Martin Luther King, Jr. grew up in a relatively well-off family. His father was a Baptist minister, a religious heritage that strongly influenced his ideas. Indian leader Mahatma Gandhi and his struggle based on non-violence, which King became familiar with as a student, also played an important role in his thinking. During the 1950s the fight against segregation intensified. Key strides were made in education. In 1954 the U.S. Supreme Court ruled that schools could not establish separate public schools for white and black students. Nevertheless, several conflicts arose when African-American students began entering schools only white students had previously attended. Another area where the fight against segregation moved forward was public transportation. In 1955 in Montgomery, Alabama, activist Rosa Parks refused to give up her seat on a bus to a white man. This was the start of a long boycott of city buses. Martin Luther King, who at the time was a pastor in Montgomery, emerged as the leader of the campaign. At the beginning of the 1960s, Martin Luther King continued the fight against segregation and discrimination in several places. In Birmingham, Alabama, sharp clashes occurred in 1963 between activists and police. King was arrested and wrote a letter in jail in which he developed his ideas about the principle of non-violence. Later the same year the large March on Washington for Jobs and Freedom took place. This is where King delivered his “I Have a Dream” speech. Two years later marches in Selma, Alabama protested against limitations on the voting rights of African-Americans. In the Civil Rights Act of 1964 and Voting Rights Act of 1965, the civil rights of all Americans were strengthened. Respect for human rights is a prerequisite for peace. In October 1964 Martin Luther King was awarded the Nobel Peace Prize for his non-violence-based fight for the rights of African-Americans. Contributions to human rights had been recognized a few years earlier when Albert Lutuli of South Africa was awarded the Peace Prize, and a few years later it was awarded to René Cassin for his work on the UN’s Universal Declaration of Human Rights. After the Nobel Prize award ceremony in Oslo, King visited Stockholm and returned two years later for a philanthropic concert benefiting the civil rights movement. The Nobel Prize helped reinforce Martin Luther King’s international reputation and involvement. Martin Luther King’s fight for the equal worth of all people extended beyond the United States. In South Africa a severe form of segregation prevailed, known as “apartheid,” which King took a stand against. In an attention-getting speech, King took a stand against the United States’ war in Vietnam. This was not only an advocacy of peace, but also a demand for reallocation of resources from warfare to measures for economic justice. The protest against the Vietnam war was controversial, and King was criticized for it. 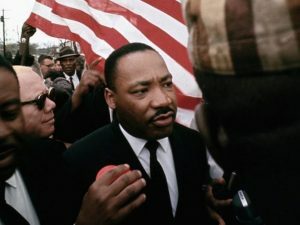 Among African-American activists, King’s non-violence principle also was challenged more openly, and the more militant Black Power movement gained momentum. On April 4, 1968, Martin Luther King was assassinated in Memphis, Tennessee. Riots and unrest followed the killing. King’s last project, the Poor People’s Campaign, continued the fight for economic justice for some time but was discontinued later. The movement took new avenues, but King’s ideas and visions about the equal worth of all people have lived on. His wife, Coretta Scott King, continued the fight and also became involved in opposing nuclear weapons and promoting women’s rights, among other things. The causes Martin Luther King fought for extend into our own time. Discrimination is still a problem in our world. People and movements that, like King, are fighting for rights and freedoms exist in many parts of our world. Martin Luther King’s dream is alive, and the exhibition’s final part will give visitors an opportunity to formulate their own dreams and share them with others at an interactive station.